A sum total of probably less than eight hours outside walking the neighborhoods over three days I spent in Auckland does not give much depth to city experience. Auckland is big and spread out across a hilly and island landscape. I basically saw about 5 miles of streets with their homes, businesses, civic center gathering places like squares and colleges, parks, memorials, restaurants/pubs, retail stores, grocery markets and museums. Snatching a day in some place like Auckland, New Zealand as a travel transit break from long distance flying is something I enjoy planning for my trips. SkyBus Auckland airport for $32 NZD round trip, about $23 USD, put me in downtown Auckland within 45 minutes of stepping out of the airport terminal. My transportation time improved to about 30 minutes the following week when I repeated the SkyBus airport round trip for a second overnight in Auckland before flying back to the USA via Sydney. Even with relatively little time in Auckland, the amount of ground I covered on foot, and additional visual information gathered from two round trips between Auckland Airport and Central Business District Auckland on 30 minute SkyBus rides each direction gave me some insight to the landscapes, seascapes, architecture on streets with homes and businesses, and passing through parks and civic center gathering places like Aotea Square and University of Auckland. Some little alterations of New Zealand were immediately noticeable, like cars drive on the left side of the road. Money is different, but honestly, debit or credit cards are accepted nearly everywhere. A city bus fare was the only cash I needed during the week. TV sports are rugby, cricket and basketball. Neighborhood sports clubs in Parnell showed me lawn tennis and lawn bowling. New Zealand reminds me of California in many ways, but a major landscape difference is the amount of green grass all around. Fortunately the rain held off for several hours of walks around Auckland to give me an opportunity to see parts of the city. My first day in Auckland was spent walking a couple of hours around the Parnell residential neighborhood, where I stayed at the Quality Hotel Parnell Auckland. 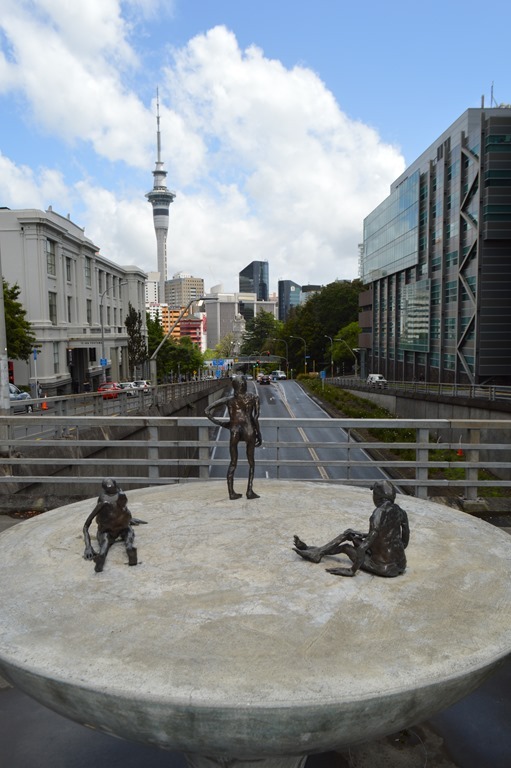 The hotel is about two miles from Auckland CBD SkyTower. My last day in Auckland gave me a distinctly different impression of the big city when staying in the heart of downtown central business district surrounded by skyscrapers, and walking around amidst heavily populated streets with a diverse mix of business people, shoppers, tourists and at times encounters with demonstrators of both political type and social lifestyle type. Drunken vocal outbursts periodically broke the intermittent sounds of silence on a Saturday night and made Auckland sound as crazy as any big city with my hotel window open. I remember Parnell more fondly as an Auckland sleeping and walking location. Wikipedia description: Parnell is an upscale suburb in Auckland, New Zealand. It is one of New Zealand’s most affluent suburbs, and is often billed as Auckland’s “oldest suburb” since it dates from the earliest days of the European settlement of Auckland in 1841. It is characterised by its mix of tree lined streets with large estates; redeveloped industrial zones with Edwardian town houses and 1920s bay villas; and its hilly topography that allows for ever present views of the port, the Waitemata Harbour, Rangitoto Island and the Auckland Domain. To its west lies the Auckland Domain, to the south Newmarket, and to the north the Ports of Auckland. SkyTower is the city landmark allowing me to judge how far I was from the Central Business District where I needed to be for the SkyBus airport bus stop. Uber car service is available around Auckland. One of the first articles I read in the Auckland newspaper was the government’s crackdown on Uber and suspension of 28 or so Uber drivers determined unfit for being a driver. New Zealand government wants similar licensing requirements applied to Uber drivers as exist for taxi drivers. Stuff.co.nz has this article, “Former driver claims Uber is like a sweatshop”. This article has links to 2016 articles for government issues with Uber in New Zealand. My 60 second take is Uber slashed fares in Auckland to grow their customer base with a possible rise in their political clout to take on the government. Drivers unhappy with lower income, taxi drivers unhappy with competition, NZ government unhappy with lack of regulation. Only the consumers are happy with more options for transportation besides your own, public or self-propelled foot power. I prefer foot-power myself when there is no convenient public transportation. Parnell Lawn Tennis Club established 1872. Auckland Museum is a modern museum inside the historic 1929 Auckland War Memorial Museum building. Be prepared for the high 25 NZD museum fee for international visitors. Locals get in free. Auckland War Memorial Museum – 1929 building. Auckland War Memorial Museum was constructed on Auckland Domain with funds raised from New Zealanders to remember the victims of war. My path crossed several exhibits and memorials for fallen soldiers of World War I during the seven days I traveled around Auckland and Napier, New Zealand. There were few signs of a remembrance day in Napier, New Zealand on November 11, our Veterans Day in USA and Remembrance Day in UK and Canada. Anzac Day is April 25, marking the start of the Gallipoli Campaign, and marks the primary national holiday for remembrance in New Zealand to the victims of war. View to the SkyTower in front of Auckland War Memorial Museum cenotaph across Auckland Domain. St. Mary’s Cathedral Church, Parnell (1897) is the world’s largest wooden gothic cathedral, designed by New Zealand architect Benjamin Mountfort. I read they built an Anglican Church in Parnell due to the long walk to get to St. Paul’s in Auckland. The wooden cathedral replaced the old St. Mary’s in the late 19th century. A late 20th century Cathedral of the Holy Trinity built 1991-95 replaced the 1897 cathedral. The gothic wooden cathedral was relocated in 1982 from its former location across the street to its present location beside Holy Trinity Cathedral. Not even sure why I walked into the cathedral. Probably due to walking right by the open door. In Europe I pop into see the inside of some churches. Holy Trinity Auckland is one of the few churches I have been inside in recent years that was not at least 100 years old. A woman greeted me upon entering Holy Trinity Cathedral. She said she was the cathedral docent. We talked about the Anglican cathedral’s history for a few minutes, until some Americans from Colorado entered the cathedral and she moved on to greet them, leaving me to walk alone around the cavernous space. The church was rather welcoming and a visual experience for me as a visitor simply walking around the Parnell neighborhood. And Holy Trinity was there to visit for free, unlike the 25 NZD entrance fee for Auckland Museum.